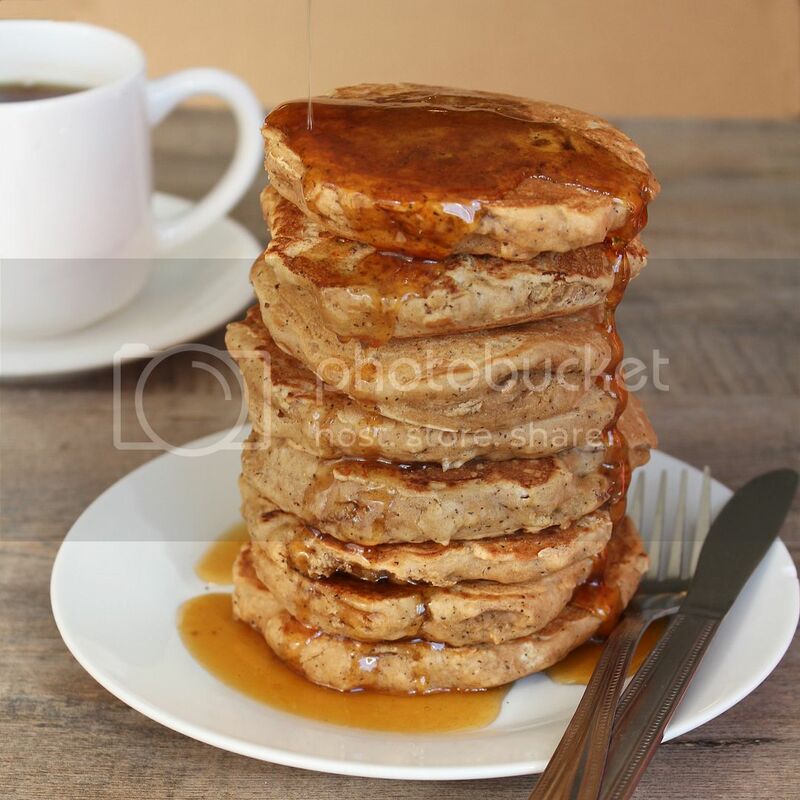 For those who have never heard of it, Pancake Tuesday (aka Shrove Tuesday, aka Fat Tuesday) falls on the day before Lent every year, and is associated with the practise of using up richer “fatty” foods like eggs, milk, and sugar (hence the pancakes) before the fasting season of Lent begins. I don’t think it serves much of the same purpose today (at least not for me, as I don’t give anything up for Lent), but it’s still a great excuse to eat pancakes for dinner! Pancake Tuesday in my household always meant a big feast of at least four different types of pancakes for dinner, so you can see how it easily became a favourite holiday for me as a kid. Now that I don’t live at home, I still carry on the tradition of pancakes for dinner for myself, but also use it as a chance to test out new and exciting pancake recipes! 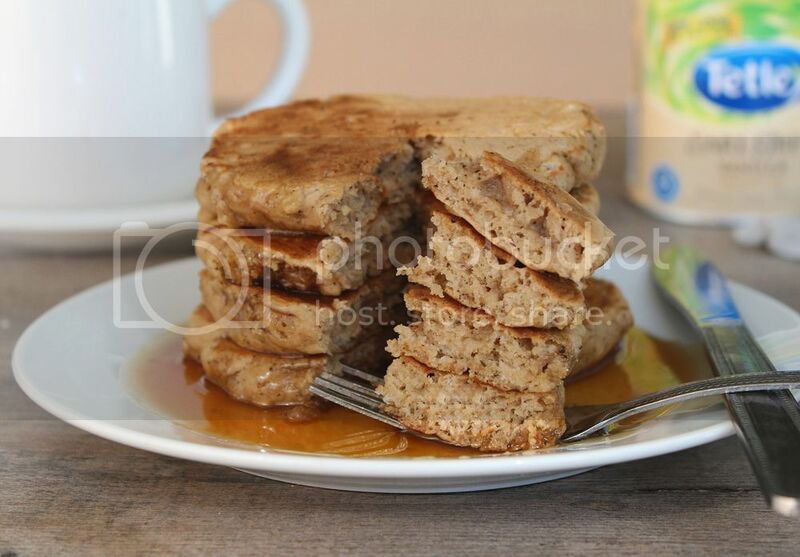 Last year I created coffee-flavoured pancakes with my delicious caramel latte pancakes, inspired by my favourite Starbucks latte. This year I decided to create pancakes inspired by my favourite tea drink, the London Fog. A London Fog is a tea latte made with steamed milk, Earl Grey tea, and vanilla syrup. Apparently Starbucks no longer calls it a London Fog and just uses the much more boring name of Earl Grey Tea Latte, but at Second Cup and Williams you can still order a London Fog, which I think sounds so much classier! 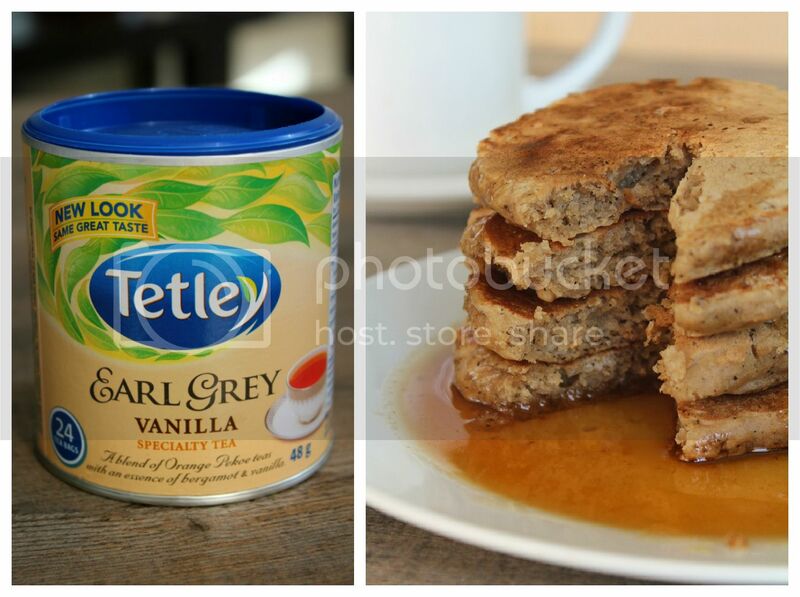 To recreate those flavours in pancakes, I knew I needed to infuse Earl Grey Vanilla tea (if you can’t find the vanilla flavour, just use regular Earl Grey) and vanilla extract into the pancakes. Baking with tea can get tricky because unlike coffee, it can be difficult to get a strong tea flavour to come out in the final baked good. In my first attempt at these, I steeped vanilla almond milk with the tea before mixing the milk into the batter. They turned out well with a lovely Earl Grey fragrance, but the tea flavour wasn’t quite strong enough. In my second attempt, I still steeped the milk but also added a bag of tea to the dry ingredients and infused tea into a honey vanilla syrup to serve with the pancakes. The end result was a light and fluffy stack of pancakes that smells just like a London Fog and has a subtle but very nice tea flavour that I loved! I think the honey syrup makes all the difference in making these resemble tea, so don’t skip it! I made these for breakfast Sunday morning and they made our apartment smell so nice – even later in the afternoon my sister kept commenting that she would get a whiff of tea wherever my pancakes had been (I had to carry them to a few different spots for photographs)! And I saved just enough leftovers to eat for dinner tonight, which I’m quite looking forward to! Sorry for the somewhat long post, and if you skipped by everything above just to see what the main point was, it’s that tonight it is perfectly acceptable, if not strongly encouraged, to eat pancakes for dinner – Happy Pancake Tuesday! First prepare the honey tea syrup. Bring honey and water to a simmer in a small saucepan. Add teabag and remove from heat. Let steep for at least 5 minutes. Remove teabag, scraping off as much honey as you can (discard) and stir in the vanilla. Transfer to a small container and place in the refrigerator to cool and thicken. Next prepare the steeped almond milk. Add vanilla almond milk and 3 tea bags to a small saucepan. Bring to a simmer, then reduce heat and let gently simmer for 3-5 minutes. Remove teabags, squeezing the liquid out as you remove them (discard tea bags). Let milk cool in the refrigerator. 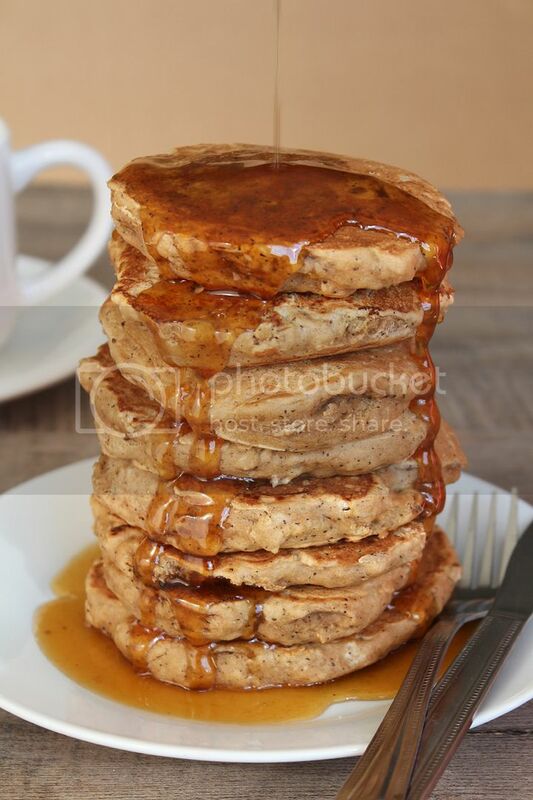 Mix the dry ingredients for the pancakes: Whisk together the flour, baking powder, and sugar. Stir in the contents of 1 tea bag. My tea was very finely ground, but if yours is not, grind it first in a food processor. Once the milk has cooled, prepare the wet ingredients by whisking together the egg, milk, vegetable oil, and vanilla extract. Add the wet ingredients to the dry ingredients and gently fold together until just incorporated. Do not overmix. Heat a large non-stick skillet or griddle over medium heat. Spray with non-stick cooking spray if desired (I find that I don’t need to). Spoon 1/4 to 1/3 cup batter (depending on desired size – I used 1/3 cup measuring cup but didn’t fill it all the way) onto the pan and use your fingers to spread it out a little into a circle. Cook until bubbles begin to form on surface, a couple of minutes, then flip over and repeat until golden brown on both sides. Repeat with remaining batter. 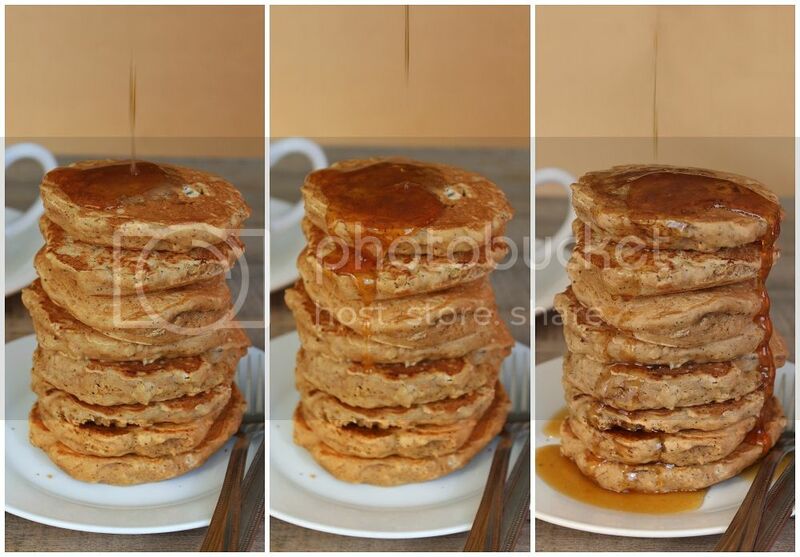 Serve pancakes warm with honey syrup.